OLD-FASHIONED FARM TUB DESIGN - These are the classic galvanized steel tubs ubiquitous on every farm because they have a thousand and one uses. Reminiscent of dairy cows and general stores, these tubs can give even the most urban garden a rustic country charm. These handmade tubs are fashioned with two side handles, making them easy to carry. This tub has has a 16.25 in. diameter and is 10.25 in. tall. GALVANIZED STEEL - These classic tubs are handmade with galvanized steel. That means that a protective zinc coating is applied to the steel which prevents rusting, increasing the durability of these tubs even when used outdoors. You can fill these round steel tubs with water and ice or use them in the garden without worrying about corrosion. VARIETY OF SHAPES AND SIZES - Our galvanized tubs are available in a variety of shapes and sizes. Mix and match designs for a coherent decor theme. Choose from round and oval shapes; small, medium, and large sizes; plain galvanized steel, copper-plated, and black finishes; and straight, hammered, or embossed designs. Refer to the infographic for finishes and size dimensions. 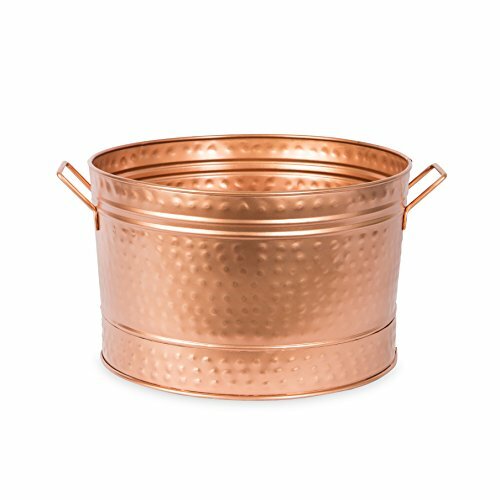 VARIETY OF USES - This galvanized steel tub can be used as an ice bucket for chilling beverages in the summer. The large steel bucket has water-sealed seams to prevent leaking. In addition, the tub can be used to hold firewood during the winter, and can even be used as a vegetable or flower planter. If used for direct planting, we recommend drilling drainage holes in the bottom of the tub. USE WITH ACHLA DESIGNS STANDS - Achla Designs' galvanized steel round tubs are compatible with our Folding Floor and Tabletop Stands. Whether used for holding chilled drinks at a party or for planting flowers on the patio, these tubs look great when supported on a metal stand.